Just a week after India's second largest mobile operator, Reliance Communications, launched its Android powered Reliance 3G Tab, Bharti Airtel also launched their Android Tablet. Airtel's Android Tablet is manufactured by Beetel. This Android powered Beetel tablet is called Magiq. Beetel Magiq is a 3G tablet running Android Froyo(2.2). It is a 7 inch TFT touchscreen like the Reliance 3G Tab. Beetel's Android tablet powered by a 1 GHz processor that means it is definitely faster than the Reliance 3G Tab. It comes with 2MP rear facing camera and 2MP front facing camera(Reliance 3G has a VGA camera at the front). It supports both 3G and Wi-Fi connectivity options and has an internal memory of 8GB which is expandable up to 16GB. It also has an optical track pad for navigation. Beetel Magiq comes with a 2200mAh battery(which is quiet less compared to Reliance 3G Tab's 3400mAh). Magiq tablet also comes with free 3G data for both prepaid and postpaid customers from Airtel. The Airtel Beetel Magiq is priced at just ₹ 9999/- and this has made it the cheapest tablet available in market today! 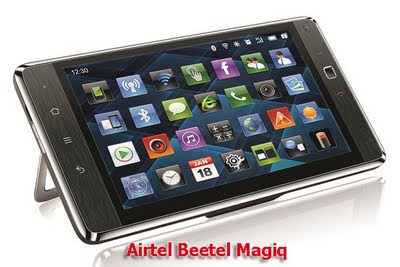 Will people choose to buy Airtel's Beetel Magiq over other tablet offerings available in the market? Only time will tell..
Indian Mobile Operators Enter "Low-Price Tablet Wars"? RCOM launches ZTE Manufactured "Reliance 3G Tab" With Bundled Data Plans. For detailed battery performance from usage of my Magiq Tab you can visit: http://magiqtab.blogspot.com/2011/09/magiq-tab-battery-performance.html. There are other posts also giving the bechmark statistics etc in my blog. Thanks for the info! I'm sure readers will find this info on ur blog very helpful!